PROMOLUX Lighting International makes specialized lighting for fresh meat display cases, combining retail merchandising advantage of superior color rendering with economic benefits of lower levels of damaging light and heat emissions resulting in extended shelf life. Studies show that color is the primary measure by which consumers judge juicy tenderness and flavour of meat. Selective buyers determine meat quality and freshness by expected clear colors of cherry red beef, pink pork, brick red lamb, soft pink pork and light tan poultry. Health officials have certified that natural colors remain true in meat display cases with Promolux balanced spectrum lamps. Low radiation specialty lighting is the key to reducing meat oxidation from light that causes myoglobin in meats to oxidize and change into metmyoglobin. This light induced chemical reaction is what causes fresh meat to lose its bright red bloom and become brown. profitable - attract sales and extend shelf life. “The retail case life of fresh beef is usually limited to 2 to 3 days due to the development of undesirable surface discoloration. This reduction in color acceptability has been shown to be related to the growth of psychrotrophic bacteria at the meat surface. The retailer can improve the keeping quality of beef by reducing the number of bacteria initially contaminating the meat and by controlling the growth of organisms which are present. Research has shown that lighting can be responsible for raising surface temperatures of up to 8° F, providing a matrix for exponential growth of pathogenic microorganisms. Virginia Tech researchers found as much as a 25° F difference between the top and bottom of a stack of fish fillets stack displayed on ice beds. When curing solutions are used in processed meats, the products easily lose their color from photo oxidation. The colors of beef, poultry, and pork look their best and stay fresh looking longer under Promolux lighting. To read a university study demonstrating how lighting conditions can extend the display life of fresh packaged beef, please download the University of Zaragoza, Spain report: Shelf Life Extension of Fresh Beef (pdf). Promolux sets the lighting standards for specialized merchandising lamps for meat and other perishable foods with the application of advanced technology to developing food safe and color balanced display lamps. The Balanced Spectrum technology built into Promolux lamps is a proprietary phosphor-coating that produces a natural, balanced light and filters out damaging ultraviolet, infrared and visible spectrum wavelengths. The quality of showcase lighting used in retail meat displays has a major impact on the shelf life and consumer selection of beef, poultry, pork, and lamb and, ultimately, on volume meat sales. PROMOLUX Safe Spectrum lamps filter damaging radiation, protecting the appearance and flavor of meat products and ensuring food safety. The best meat processing departments, butcher shops, and restaurants use Promolux lighting to showcase their fresh and processed meat products for longer lasting fresh appearance and improved food safety. You can make an immediate improvement in your retail meat displays by installing Promolux Safe Spectrum display cases is often too bright and produces washed out colors with strong yellow and green portions of the visible spectrum. Supermarkets and meat retailers can easily replace old lighting products that accelerate browning and fading for more effective marketing and cost efficiency. Photo oxidation causes the degradation of color pigments formed during the meat curing process. Chemicals in the cure, and oxygen in the presence of energy from ultraviolet and visible light, all contribute to a chemical breakdown and microbial spoilage of the meat products. In addition to browning the surface color of meats, conventional display case lighting can produce enough heat to elevate the surface temperature of the cuts of meat and encourage the growth of dangerous food-borne pathogens such as Listeria monocytogenes and Salmonella. In turn, bacterial growth accelerates the oxidation of myoglobin. Even when grocery meat departments use modified atmospheric packaging (MAP), exposure to radiation from supermarket lighting can still shorten the shelf life of fresh meats on display. As meat case lighting penetrates the transparent meat wrappings, a greenhouse effect develops in which radiant heat is trapped next to the surface of the meat. A temperature increase of only a degree or two can cause fresh meat to spoil at faster rates. Promolux food safe lamps can give your meat department a solid reputation for natural freshness and consistent appeal that will win loyal and satisfied customers—and higher retail sales. Much of this light induced food quality damage is preventable or, at the very least, reduceable. 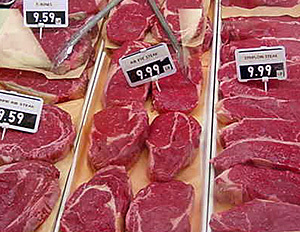 Promolux lamps are easily installed in your meat display fixtures for immediate visual impact. For your easy switch to Promolux, we carry a wide variety of lamps of all standard sizes and wattages. Even when meats are perfectly safe, consumers prefer ideal fresh meat colors and avoid buying faded and browned colors that come from surface oxidation. Meat and poultry color plays an important role in impulse buying of beef, ground meats and poultry. When Promolux low UV, balanced spectrum lamps are used in refrigerated meat display cases, poultry colors appear fresh longer and beef bloom colors can last until the meat is sold. Studies have shown that over a third of all purchases from self-service meat counters are impulse buys, and that consumers tend to select meat based upon its color: red meat displays are perceived to be fresher and more palatable than meat that has turned brown. Therefore, the ideal time to sell fresh beef, pork, and lamb is when the meat is blooming. However, there can be problems with general-purpose supermarket fluorescent lighting that is frequently too bright and over-emphasizes green and yellow segments of the visible spectrum. If meat displays do not look appealing even when the meat is blooming, much of the meat will not sell before it spoils or turns color. When red meats look brown, and white fats appear yellow or green under lighting that is too bright and out of balance, sales and profits will suffer. 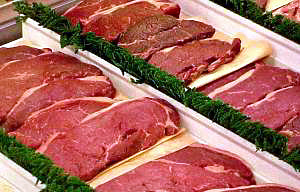 Studies by the National Cattlemen’s Beef Association and other groups estimate that $1 billion worth of beef is wasted each year in the United States, a loss of 4% or 5% of the wholesale price, and up to $200 million is lost in Canada each year as a result of beef spoilage and discoloration in retail store meat departments. Why install Promolux in your refrigerated meat showcases? Promolux true full spectrum lamps diminish meat display case lighting problems associated with radiation and overheating that can degrade food flavors and appearance. Promolux lamps emit lower levels of ultraviolet radiation and heat than other commercial lighting commonly found in meat display cases, and allow bloom periods to last for longer periods of time. PROMOLUX specialty meat display lamps are the perfect lighting choice for the meat industry. Click here for more information about Promolux balanced spectrum specialty lamps for your meat showcases. © Copyright 1998-2019 Market Group Ventures Inc. All rights reserved.